Todd Henrie, 309th Software Maintenance Group, speaks during the Persons with Disabilities annual awards luncheon at Hill Air Force Base, Utah, Oct. 22, 2015. Henrie, who began his federal career as a summer hire, shared personal stories and explained how his disability has not held him back from the outdoor activities he enjoys. 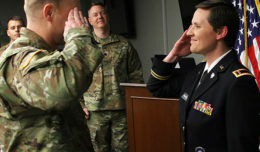 HILL AIR FORCE BASE, Utah — A series of wrong choices one night – driving too fast without a seat belt – resulted in an automobile accident that would leave 17-year-old Todd Henrie with a lifelong disability. Accident investigators estimated Henrie entered a 25 mph corner doing nearly 100 mph before he hit a telephone pole that threw him from his car, breaking his back and losing use of his legs. 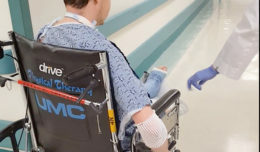 He spent three months in the hospital, and several years, learning how to live life again with the aid of a wheelchair. Thirty-plus years later, he is now a director in the 309th Software Maintenance Group, and spends most of his free time getting the most out of life in spite of his disability. Henrie said he struggled for a long time following the accident thinking his life was over because he might not be able to do the sports he loved such as skiing. 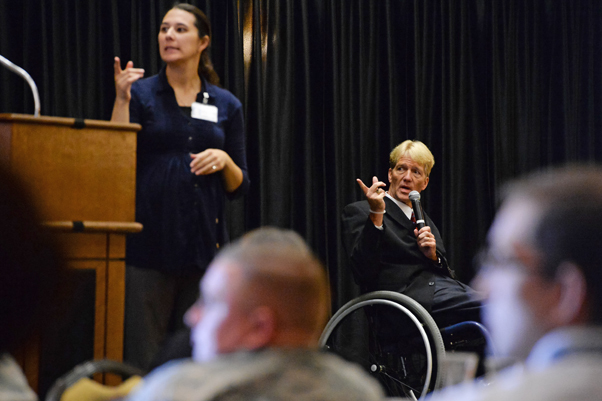 Henrie shared his personal story during the 2015 Persons with Disabilities Awards Luncheon Oct. 22 at Hill AFB. With the assistance of specialized equipment, Henrie now plays basketball, participates in marathons, rides bicycles, scuba dives, camps, boats and rides four-wheelers. He also recently took up skiing again. Henrie said everybody has their own physical challenges or disabilities. “It’s not so important how others label you, but how you label yourself,” he said. He credits the “angels” in his life, including many people from Hill AFB for his success in progressing to where he is today. During his closing remarks, Henrie challenged people to look past a person’s disability and see the real potential in them.